The practice within the MEDTRENDS project illustrates and maps the main scenarios of maritime economic activities for the EU Mediterranean countries in the next 20 years. It shows an in-depth analysis of the current situation and future trends in 10 of the main maritime economic sectors, their drivers and environmental impacts. The analysis is done in particular in the context of the 10% marine protected areas target set for the Mediterranean and the GES objectives of MSFD. Results are available through a dedicated web-portal for 4 of the most important sectors: offshore oil and gas exploration and extraction, maritime transportation and port, professional fisheries and tourism. Results for other sectors (recreational fisheries, marine aquaculture, marine renewable energy, marine mining, coastal development, land-based pollutions sources) are included in MEDTRENDS reports. The analysis was implemented at the Mediterranean regional or sub-regional (Adriatic Sea) scales and more specifically at the level of the 8 EU Mediterranean countries (Croatia, Cyprus, France, Greece, Italy, Malta, Slovenia and Spain. Which are nowadays the major drivers of change for the Mediterranean Sea environment? Which are trends of key economic sectors in the Mediterranean? How is the interaction between economic sectors in the Mediterranean? 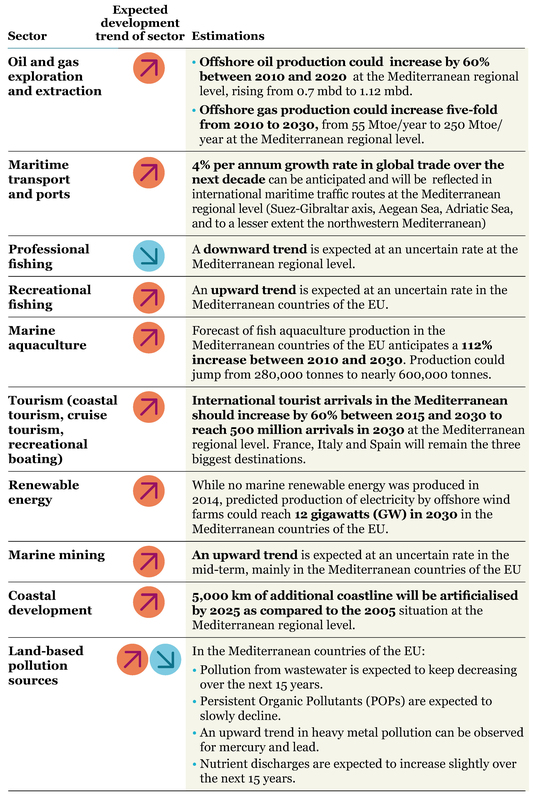 Which is the risk of not achieving the 2020 Good Environmental Status Target in the Mediterranean? How is the interaction between maritime economic sectors and Marine Protected Areas (MPAs)? Will the 2020 target of 10% MPA coverage be achieved? Which spatial planning recommendations can be given? Which recommendation can be given for maritime sectors? The scenarios of maritime economy and their impact on ecosystem in the Mediterranean were developed in the framework of MEDTRENDS project. The collection and analysis of geo-localised socio-economic and environmental information on 10 key maritime sectors was combined with a wider spatial analysis that helps identifying interactions and conflicts between sector development and the protection of marine ecosystems. The analysis investigates these interactions at the Mediterranean regional or sub-regional scales and more specifically at the level of the 8 EU Mediterranean countries (Croatia, Cyprus, France, Greece, Italy, Malta, Slovenia and Spain). Today’s situation and future developments up to 2030 were considered. MEDTRENDS collected data and map integrated scenarios of maritime economy growth at transnational level in 8 EU Med countries over the next 15 - 20 years. An overall analysis of growth trends and potential cumulative impacts of human activities at sea has been carried out in the particular context of the 10% marine protected areas target set for the Mediterranean and the good environmental status objective set by the MSFD. Considered topics include: wind energy, shipping, ports, oil and gas exploration and extraction, pipelines and cables, coastal development, sand and gravel extraction, military activity, industrial pollution, tourism and recreation, commercial fishing, aquaculture, agricultural runoff, climate change, coastal chemical plants, desalinization plants. Future trends of key maritime sectors resulting from MEDTRENDS analysis are summarised in the following table. Conflicts regarding space use when one sector excludes some or all other sectors from specific areas. This can be the case for coastal activities that develop in already crowded areas. Conflicts may also rise offshore, e.g. between maritime traffic and increasingly developed offshore oil and gas infrastructures. Negative effects some activities may have on other activities that are highly dependent on healthy ecosystem services (e.g. fishing and tourism). Competing interests due to the exploitation of the same marine resources. This is the case for professional fishing that competes with the constant increase of recreational fishing. Some relatively old oil and gas production sites are located in the vicinity of MPAs (e.g. in the Adriatic Sea) and generate pollution risks. Several oil and gas exploration contracts overlap with MPAs (e.g. the Marine Park of the Gulf of Lion in France) which should be avoided. A large number of oil and gas exploration contracts overlap with priority areas for conservation, which have not yet been given protection status, such as in the Western Hellenic Trench. Many MPAs are located in the vicinity of maritime routes and are under the risk of a pollution incident due to maritime traffic. The Aegean Sea is known as a hotspot for ship accidents and should be given special consideration in the future. The development of maritime sectors in the Adriatic Sea suggests that maritime traffic authorities should seek to foresee increased risks associated with maritime traffic and act accordingly. A significant share of maritime traffic overlaps with priority areas for conservation, in particular those concerning marine mammals, especially in the Straits of Sicily and the Alboran Sea. The current interactions between tourism and MPAs are high along the northern shore of the Mediterranean. Some MPAs face the cumulative pressures of intensive coastal tourism and leisure crafts, for instance on the French Riviera or in the Balearic islands. The expected growth of tourism in the Mediterranean region may lead to growing pressures on vulnerable areas. Areas suitable for offshore wind energy development are mainly overlapping with EBSAs (Ecologically or Biologically Significant Marine Areas), except to some extent in the Adriatic Sea. The potential impacts of wind farms on the marine environment need to be better known and the monitoring of the first operating sites will be very important to suggest best practices for future large developments. MPAs in the Mediterranean Sea region accounted for 1.08% of its area in 2010 (Pelagos Sanctuary excluded). This area increased to 3.21% according to a 2015 assessment, most of the new designated MPAs being located in EU waters. To achieve the target, the EEA estimates that the EU Member States should designate over the next 5 years the same area of MPAs as they have already designated under the marine Natura 2000 network over the last 20 years. It is thus unlikely that the 10% target will be achieved in 2020 at the Mediterranean regional scale. While the EU will boast the highest level of achievement, very different levels of progress will be occurring between the 8 EU Mediterranean. The adopted methodology is well described in its steps in the main source report (Piante C., Ody D., 2015. Blue Growth in the Mediterranean Sea: the Challenge of Good Environmental Status. MEDTRENDS Project. WWF-France. 192 pp.) and in principle could be applied to other regional or sub-regional seas. MEDTRENDS scenarios, results of the interaction analysis (among economic sectors and between these and MPAs) and recommendations can underpin further studies, projects and initiatives at the Mediterranean and sub-basin level, including those on Blue Growth and MSP. Funding Source: the trends and scenario analysis was developed within the MEDTRENDS project, funded by MED program (ERDF funds) and by the French Ministry of Environment, Energy and Sea. SOER, 2015. The European environment. State and outlook 2015. A comprehensive assessment of the European environment’s state, trends and prospects, in a global context. Online available: http://www.eea.europa.eu/soer; accessed 07 July 2016.